Nestled in the south east pocket of Outback Queensland, there’s a stretch of bitumen that’s known for its afternoon shows. Follow the candy coloured dusks along the Sunset Way, a 1.5-hour tourist drive that takes you west through a string of tiny towns from Tara to Surat. But sunsets are known for their beauty as much as their modesty – gracing the skies with short performances before descending below the horizon. 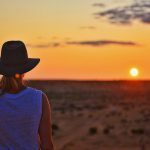 Make the most of the daily show and set up camp along the way – taking in those classic outback sunsets with a coldie in one hand and a camera in the other. Take the road less travelled with these camping spots along the Sunset Way. If you’ve had quite the adventure already getting to the eastern entrance of the drive – take a break before you begin at Tara Lagoon on Undulla Creek. Here you’ll get the first taste of the pastel paradise – roll out your swag along the banks of the lagoon and watch the sun’s rays dance across the water. Arrived extra early for the show? Drop in a line, stroll the 2km of pathways along the water’s edge, or head down to the main street for a pre-empting sundowner at the Commercial Hotel. You’ll be humming Home Among the Gum Trees on repeat for your stay at The Gums Sports Club. You get more bang for your buck here, with a golf course attached to the club and it’s camping sites. With a tiny population of less than 200, it’s likely you’ll have the course all to yourself – giving you the perfect opportunity to hit a few holes in one as you stroll through the sand greens at sunset. In true country welcoming style, you can pay your green fees in the honesty box. Club Hannaford camping, exclusively yours! Swap golf clubs for tennis rackets at Club Hannaford, the next stop along the Sunset Way. The tiny community of Hannaford happily share their grounds (which has bonus tennis courts) with travellers who are looking to set up camp in their quiet little spot on the map. Pop next door to say hello at the post office residence, where the friendly postie is also the camping caretaker. 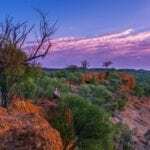 In Meandarra, you’ll find Brigalow Creek runs the length of town, with plenty of space to set up camp along the riverside. There’s powered sites and amenities at Apex Park on the northern end, or if you’re self-contained take your pick of spots right along the river. The whole length of it is just a short stroll away from a pub meal, to the café, or groceries. 5. 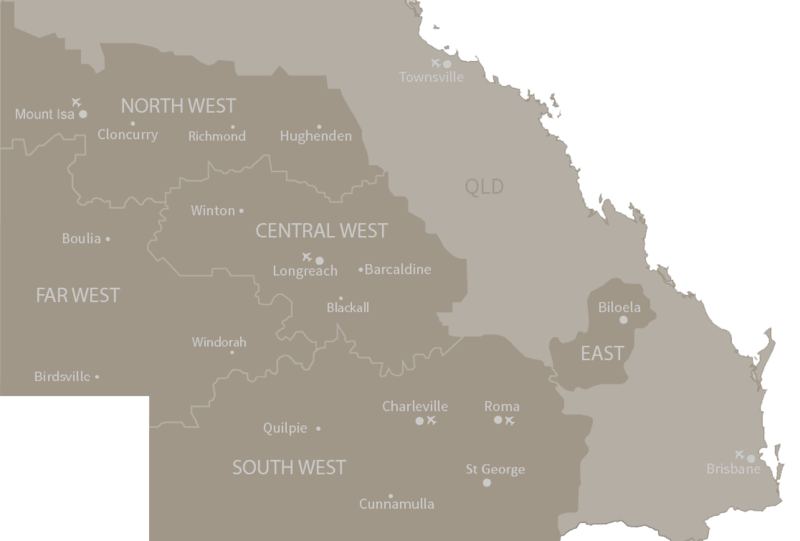 Glenmorgan – the very centre of town is yours, free. Glenmorgan’s Camp Spot, right in the tiny town’s centre. Stay in the ‘CBD’ of the tiniest town along the way – Glenmorgan – free of charge and everything within reach at a one block walking radius. Stock up at the general store that sells everything under the sun (see what we did there), sink a coldie at the hotel and hang out next door at the quaintest 1940‘s style Vintage Garage with classic cars on display (that asks only a donation for entry). The camp spot itself is at the historic railway siding, known as the ‘End of The Line’, since the railway line was never extended west towards Surat, as promised by the politicians more than a century ago. Watch as the sun dips below the town buildings and sinks into the railway tracks – letting the town shine. Consider leaving a little donation as you leave to help the group of local volunteers who maintain the camp site. 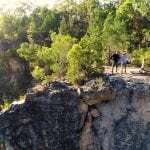 If you’re an avid gardener, or just harbour a love for Aussie flora – then a stay at the Myall Park Botanic Gardens will only grow your interest in Glenmorgan. It’s not often you get a primly pruned garden as your camping backyard, let alone an internationally recognised collection of botanical specimens. The bonus of garden camping is the self-guided walking tracks are best enjoyed in the early morning and late afternoon – when the rays are sun kissing the flowers goodnight as the light of the stars slowly sweep across the sky. Myall Park Botanic Garden is a short 7km drive north of Glenmorgan’s town centre and features an onsite gift shop and gallery of botanical paintings. 7. 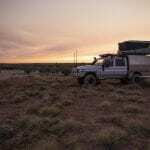 Fisherman’s Park Campground – with Balonne River Fishing! Finish off your drive with a celebratory bevvo along the banks of the Balonne River at Fisherman’s Park Campground in Surat. Known for its top-notch camping and fishing, try your hand at pulling in a mighty Murray Cod while you’re there – after all, casting a line at dusk is what all picturesque fishing dreams are made of. The bonus is, it’s not just a great campsite itself, but it’s just a short stroll down the riverside and through the picturesque Lions Park to Surat’s main street shopping and the famous Cobb & Co Changing Station. Have you travelled the Sunset Way? Where did you stay along the way? This post is sponsored by the Sunset Way.